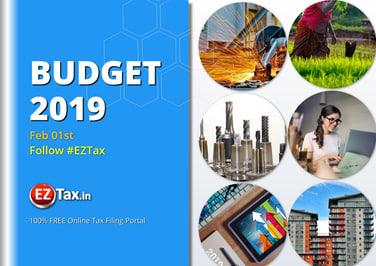 New 2019 Interim India Budget was announced by FM Mr. Piyush Goyal on Feb 01st 2019. EZTax.in has compiled the updates for you to understand from the perspective of a taxpayer. Get to know what is Budget, Changes in the current budget, direction, 2020 FREE Calculators and tools required for you to know the impact. A budget is a financial plan for the specified period. The Government of India i.e., Ministry of Finance after consultation with all the other ministries prepares the budget. The budget will be generally presented by the Finance Minister on the first day of February in Parliament. The proposed budget will come into effect from April 1st of the respective year. A relief mainly to middle class, and the farmers. Given the priority to taxation reforms, women empowerment, workers in unorganized sector and agriculture. All Income Tax returns to be processed in 24 hours and returns issued simultaneously. Individual Tax payers with annual taxable income of Rs 5 lakhs will get full tax rebate. Individuals with Rs 6.5 lakh as gross income is not required to pay any tax if they have investments. Standard tax deduction for salaried employees increased to Rs 50,000 from 40,000. No income tax on notional rent on 2nd house property. TDS threshold on rental income per annum has increased from Rs 1.8 lakh to Rs 2.4 lakh. TDS threshold on interest on bank and post office deposits raised from 10,000 to Rs. 40,000. Electronic verification and assessment of returns selected for scrutiny will be done in 2 years. There is increase in number of returns filed from 3.79 crore to 6.85 crore and increase in tax collections from 6.38 lakh crore to 12 lakh crore this year. 99.54% of all IT returns were accepted immediately without scrutiny. Benefits u/s 80(i)BA has be extended for 1 more year for the housing projects approved till the end of 2019-20. For Real Estate, Income Tax relief on Notional rent from unsold houses extended to 2 years. Direct Income Support of Rs 6000 per annum for farmers holding unto 5 acres. It will be credited to the farmer’s bank account in 3 instalments. Allocation of funds has been increased to Rs. 750 crores for Rashtriya Gokul Mission (Fisheries & Animal husbandry). Workers in unorganized sector will get assured pension of Rs 3000 per month after retirement with monthly contribution of Rs 100. 22nd AIIMS to be setup in Haryana. Already 21 AIIMS established. 10% reservation for economically backward classes (EBC) in addition to existing other reservations. India has become the largest hub of Startups as the Indian youth has turned from job seekers to job creators.